Someone asked me the other day what my favorite building in New York was. I hadn't thought about it before, but then, I never like picking favorite anythings. I came up with two buildings - the Philip Johnson (formerly AT&T) Sony Tower and the Roche-Dinkeloo Ford Foundation Building. 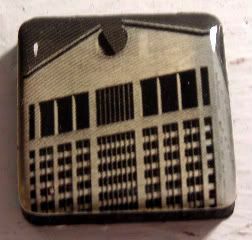 You'll see on this magnet the broken pediments at the top of the Sony building that I just love, love, love. Some people deride the building as a little too Chippendale, but wherever I am in the city, whenever I see this building top, I think of home. It looks like a lot of the furniture I grew up with. It's fairly boring down the rest of the building, but the building base is quite breathtaking, with its daunting seven-story entry archways and giant lobby. Great building. And a far cry from the other building that Johnson completed in 1984 - PPG Place, one of my faves in Pittsburgh. As far as the Ford Foundation building on 42nd Street - well, you'd never know it from the outside, but it's probably one of the most peaceful places in town. If you go during a workday, you can often find yourself alone in a gorgeous garden, complete with lily pond. My favorite part is looking up at the sunlight to see the steel girders and glass walls, but also seeing all the Foundation folks going about their workday behind the glass. It must be fab to work there, able to open their windows into the 12-story atrium. There's one other building that I am in complete love with - the Sloan & Robertson Fred F. French building, also in Midtown. I discovered this one from the observation deck at Top of the Rock. You would not believe how cool this thing looks from up there. The level of detailing 38 stories up is superb. Simply gorgeous. I would love to get into an upper floor conference room in one of the neighboring buildings, just to see those allegorical panels up close. I'm convinced that those allegorical themes are really some sort of ritualistic thing, perhaps a secret NYC coven or ancient underground society. Mark my words. Which leads to the other reason I picked this magnet. I want to share one of my new fave blogs - Scouting NY, written by a location scout here in town. The About Me blurb mentions something about New Yorkers never noticing the little details of our surroundings. How true. But, since I live for those details, I've enjoyed reading the various buildings and details that he's discovered on his scouting jaunts around the boroughs. A must for the ole Google Reader. You can't spell magnetism without MIES as in Mies van der Rohe the much maligned Bauhaus architect. And on topic as well, since Philip Johnson did the interiors of Mies van der Rohe's Seagram building a few blocks over. Heh.